There are a lot of unnecessary inventions. But these my hubstripping friends is a fantastic invention for the internal hub community!A excentric bottom bracket for standard bicycle frames!!! This means it´s not necessary anymore to have horizontal dropouts or a kind of rear chain tensioner. The “Exzentriker” from Trickstuff will widen the variety of bicycle frames for internal geared hubs enormously. 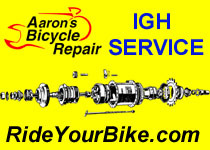 You can use the bottom bracket with single speed cranks (24mm axle diameter like Shimano Hollowtech II standard). Here is the link for more (german) details. The “Exzentriker” is available. The price is 149,- Euro.